Aloo Matar is a popular North Indian vegetarian dish. It is a easy to make simple dish. Perfect side dish for all types of rotis and parathas. I made this dish using milk, you can use cream to make this dish tasty and creamy. If you don’t have cream in fridge you can use milk or coconut milk to make this dish. Pressure cook the potatoes till done. Peel them and cut them into medium sized pieces. Heat oil in a pan and add bay leaves with jeera and fennel seeds. Now add the peas, potatoes, little water and salt, cook for two to three minutes. Add the kasoori methi and cook for a minute. Reduce the flame and add the ground cashew nut paste to cook for a minute. Then add thick cream or milk or coconut milk and just heat the mixture. Switch off the gas. 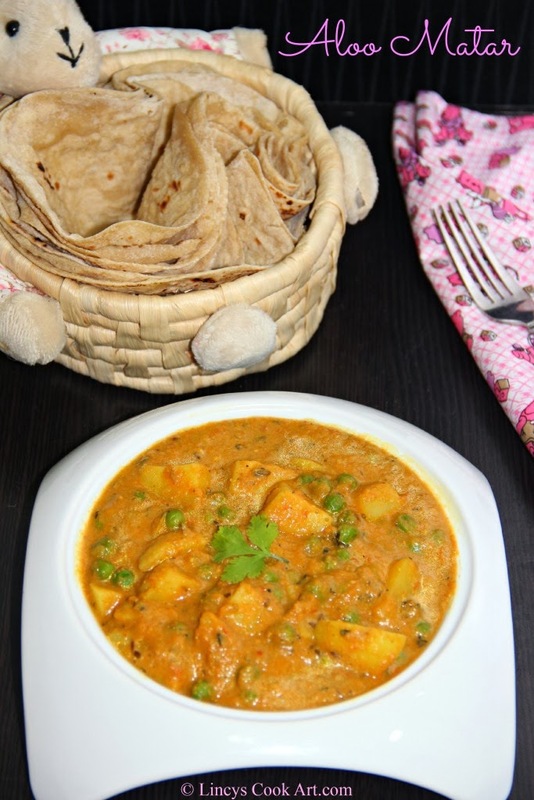 Delicious, creamy aloo mutar. Nice dish. Superb creamy aloo matar. Fantastic presentation. That looks delicious dear :) Nice Presentation !! Mouthwatering side dish. Love that bowl. Nice one! I also liked the roti basket. They look awesome.. roti basket is so cute..
Love anything with potatoes and yes, one of our fav dish.